For the past few days, I’ve had the all-new 10th generation Kindle which replaces the old 8th gen Kindle. If you ask us why Amazon skipped the 9th gen Kindle we’d tell you it’s because seven ate (eight) nine. Bad jokes apart, it has the same 6-inch display, same plastic shell, and is available in black and white colour options. 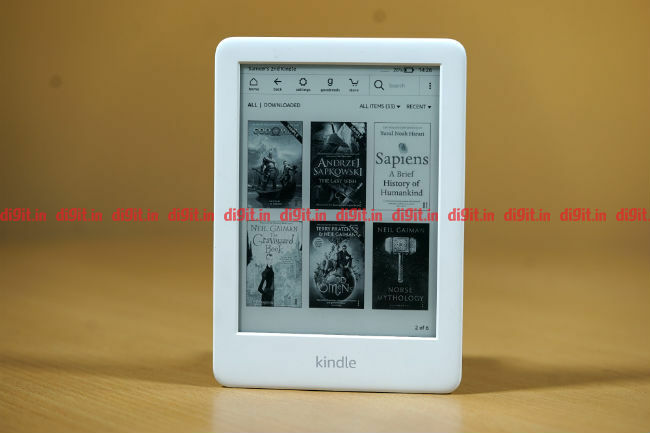 But this time around, the entry-level Kindle is Rs 2,000 more expensive than its predecessor and brings with it some new features. So let's see what my past few days have been like with this e-book reader. In the box, you get the Kindle along with a USB cable. Yes, the device still uses microUSB and not USB-C which is fine considering one will have a lot of old microUSB cables lying around the house. That’s all you get in the box. Setting up the Kindle is as easy as connecting to the Wi-Fi, logging in with your Amazon account and you are good to go reading. The Kindle has to be one of the easiest devices to set up and the UI is the same as the Kindle Paperwhite (read our review here) and the Oasis (read our review here) we reviewed earlier. 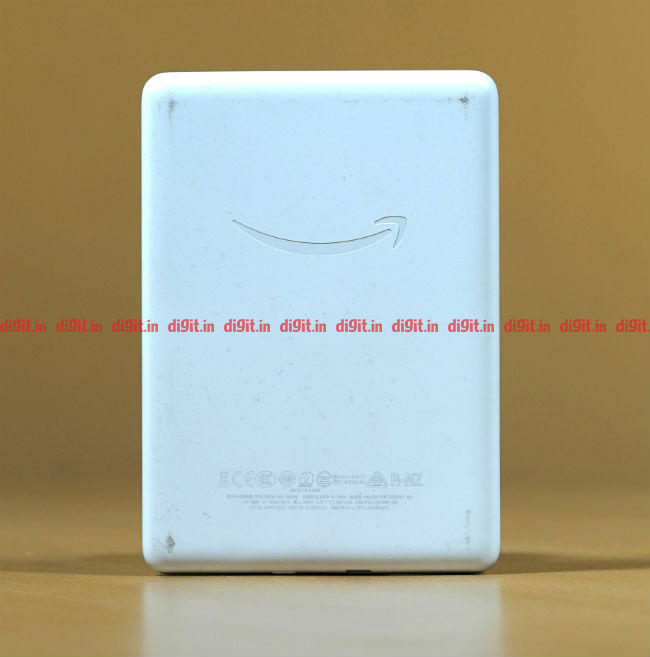 Compact is the first thought which comes to mind when you see the Amazon Kindle 10th gen. The review unit we received was white in colour with a plastic shell that feels pretty sturdy. The device looks like it can handle a few drops but we don't recommend dropping it. At the bottom, you have the microUSB port along with the power button and the LED indicator. The matte white finish looks clean and nice but will gather dirt easily. If like me you are worried about this, you may want to consider the black colour option or invest in a case. 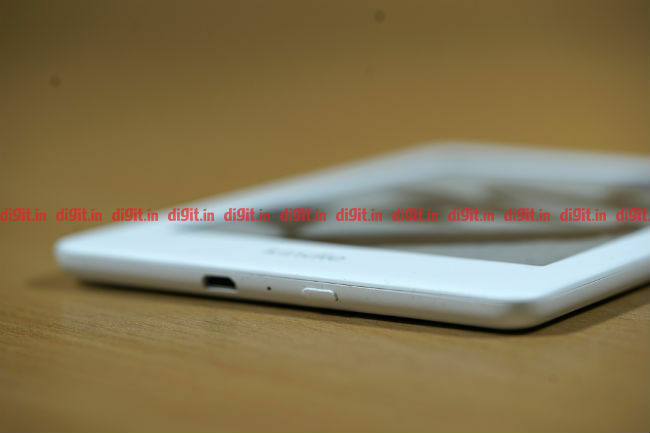 The 6-inch display is surrounded by bezels and that's good as it gives you grip on the device. The bezels aren't too thick or look ugly, nor are they too thin to not work as a grip. They feel just right and through my hours of reading, I enjoyed the ergonomics this compact build and lightweight device brings. 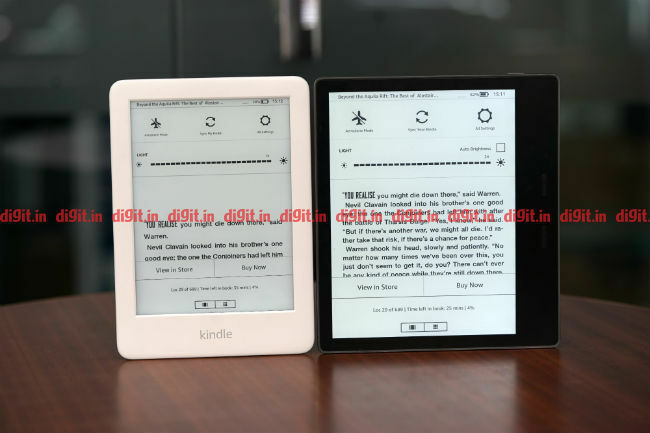 The 10th gen Kindle weighs 174 grams which is heavier when compared to the 161 grams the 8th gen Kindle weighed. 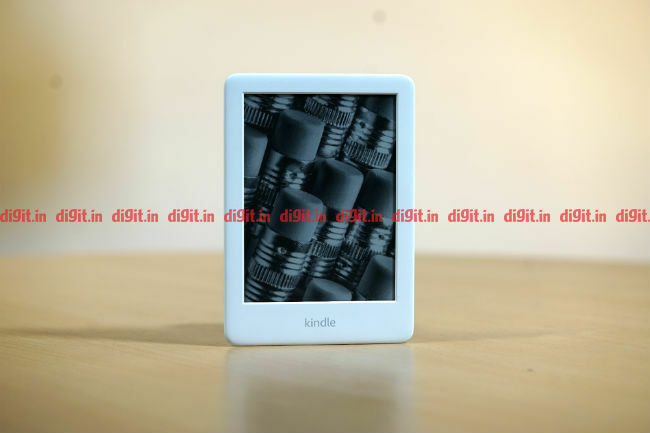 Overall, the build of the Kindle is plastic, similar to what we have seen on the Paperwhite. The display of the 10th generation Kindle has some plus points, but also some drawbacks. Having used the Paperwhite and the Oasis (both of which are much more expensive of course) the first thing that strikes you is the low resolution of the display. 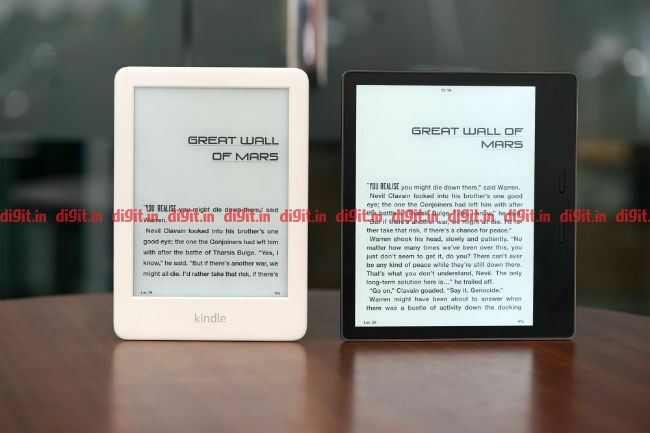 The 10th gen Kindle has a 6-inch display with a pixel density of 167ppi, the same as its predecessor, whereas the Paperwhite and the Oasis have a 300ppi. When I handed the Kindle out to people in office, they thought it was a good reading experience but the text looked a little blurry. Showing them the Oasis side by side with the Kindle and they could make out the lower resolution of the display on the Kindle. But if this is your first Kindle, you may be okay with the resolution. Considering the Rs 2K price hike from the previous generation, we would have liked to see an increase in the pixel count. One thing which has changed is the backlighting. You now have 4 LEDs backlighting the display making the display comfortable to read in the dark. The auto-adjusting light sensor is reserved for the Oasis only, but the fact that the base Kindle can now be used in the dark is nice. You will have to adjust the brightness manually though. Another thing to note is that the device doesn't have the black and white colour inversion found on the Paperwhite and the Oasis, a feature which I very much like. 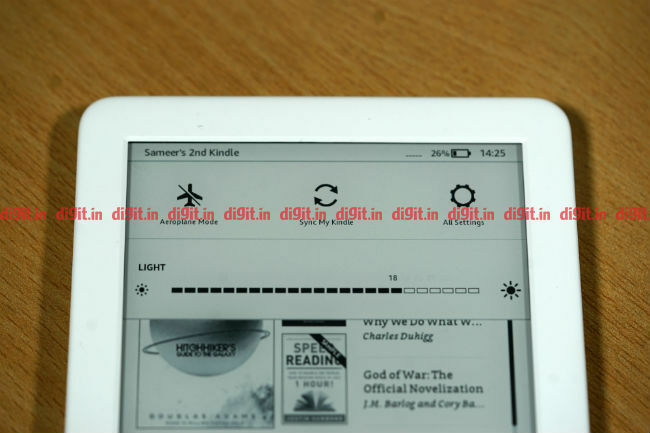 When it comes to the performance of the Kindle, it is smooth with no noticeable lag. The device isn't as fluid as a smartphone, but when compared to its brethren, it performs well, responding to touch and refreshing the page is fast enough so as not to hamper the reading experience. Overall, we are okay with the lack of auto adjusting LED at this price point but we wish the display had a higher PPI to make content look crisper. The performance is as fluid as its big brother, the Paperwhite. Being an e-book reader, we can expect a crazy long battery life for the device. Amazon claims the device can last for weeks of usage. If you read for about half an hour a day keeping the backlighting to the lower side, you should get a week-long life from this. The battery life of the device is good and it will definitely outlive your smartphone if you compare the 2 for battery life when reading. If you are a voracious reader, the battery will last a few days. If you are looking to buy a Kindle, there are three options for you to choose from. 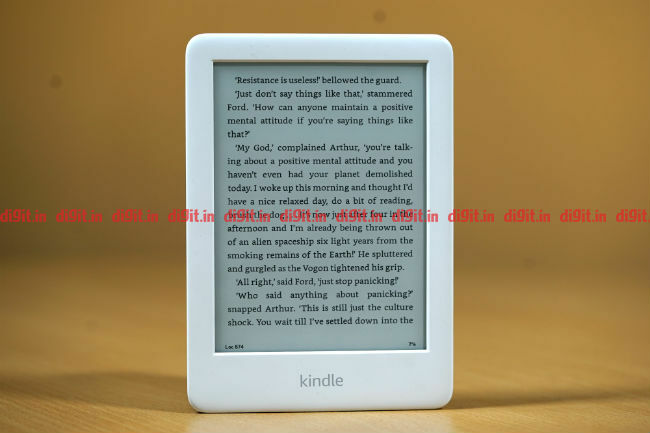 You have the entry-level Kindle priced at Rs 7,999. Then you have the new Paperwhite which is priced at Rs 12,999. At the top of the line, we have the Kindle Oasis. Priced at Rs 21,999, the Oasis brings with it a plethora of features that you can read about in our in-depth review here. 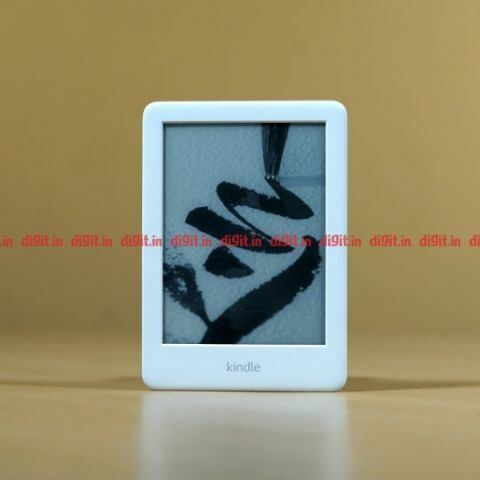 The old 8th gen Kindle is still selling for Rs 5,999 but we think that will sell only till stocks last. If you are an avid reader looking for a dedicated device to read your library on, I recommend investing more and getting the Kindle Paperwhite. For Rs 5,000 more you get a better design, twice the storage, twice the display resolution, black and white colour inversion option and waterproof IPX8. Since this is a device you will buy once and use for a few years, the extra investment is a better value for money proposition. However, this doesn't mean that the entry-level Kindle is bad. If this is the first time you are switching to a dedicated e-book reader and are looking to test the waters before diving in then you can consider it. Although I'm not sure whether the price bump of Rs 2,000 is justified considering the biggest change is the backlighting.